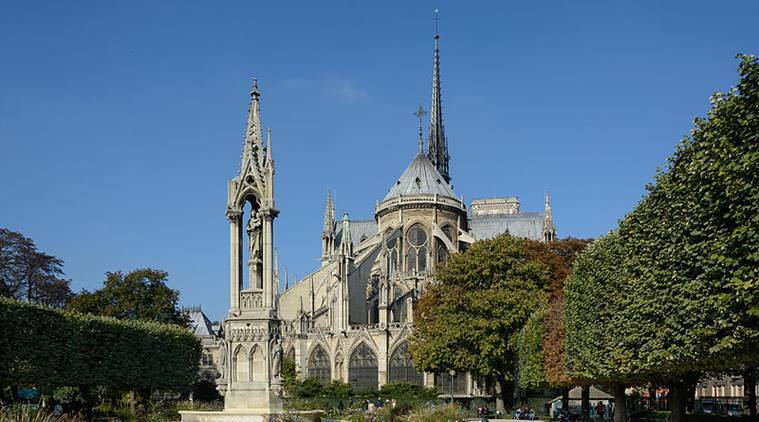 Notre-dame De Paris has been witness to several important religious and ceremonial events. For instance, in 1431, Henry VI of England was made king of France here. In 1804, Napoleon Bonaparte was crowned emperor at the cathedral. In 1909, Joan of Arc, was beatified here by Pope Pius X. As a fire engulfs the cathedral of Notre-Dame in Paris, here are some facts on the iconic monument that you can share with your child. The Cathedral of Notre-Dame in Paris, among the most famous landmarks of the city, draws nearly 13 million visitors annually. The seat of the archbishop of Paris, the Gothic cathedral whose name means Our Lady of Paris (Notre-Dame de Paris), was built over 200 years ago, between 1163 and 1345 during the reign of King Louis VII. Several of its beautiful stained glass windows date back to the 13th century. Located in the heart of Paris, on the small island of Ile de la Cite, the Notre Dame is 425 feet long, 157 feet wide and 114 feet high. Its pillars have a diameter of 16 feet. The iconic twin towers are 226 feet high, with 387 steps. The Catholic church has been witness to several important religious and ceremonial events. For instance, in 1431, Henry VI of England was made king of France here. In 1804, Napoleon Bonaparte was crowned emperor (he reportedly crowned himself!) at the cathedral. In 1909, Joan of Arc, was beatified here by Pope Pius X. After it fell into decay during the French Revolution, Victor Hugo’s 1831 novel The Hunchback of Notre Dame brought attention to the monument and was instrumental in restoring its lost glory, overseen by architects Jean-Baptiste-Antoine Lassus and Eugène Viollet-le-Duc. The statues seen on the walls of Notre Dame include fantastic creatures like the gargoyles and chimera were added during the reconstruction, along with the 12 apostles. The South tower houses Notre Dame’s Emmanuel Bell, its largest, which weighs 28,000 pounds. During the French Revolution, 20 of its bells, were melted down to make cannons. These were replaced in the 19th century and then again in 2013, because the previous ones were considered dissonant. Among the largest religious buildings in the world, the Crown of Thorns, believed to be worn by Jesus Christ before his crucifixion, is kept in the cathedral. Interestingly, over 50 acres of trees were apparently cut down to construct the wooden timber frames, with each beam constructed from an individual tree. The wooden latticework was popularly known as the “forest” for this reason and is said to have contributed to the raging fire.